Home / Region / Baton Rouge / LAFM TV 11th Season! Episode 2! LAFM TV 11th Season! Episode 2! Hey everyone! We have a great show lined up for you tonight! We have LSU football legends Lonny Myles and George Bevan coming in-studio for a visit. We also have a couple of coaches in Brusly Assistant Coach Trent Ellis and Woodlawn (BR) Head Coach Daniel Luquet coming in studio with their star players in Brusly QB Jason Holliday and Woodlawn (BR) RB Javin Myers. 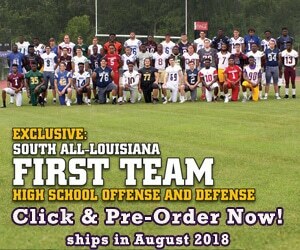 Woodlawn (Shreveport) Head Coach Jerwin Wilson is calling in to talk about his team and star Loyola Prep RB Ethan Stansell is calling in as well to talk about the great start to his season. It should be a great show so make sure that you tune in to LAFM TV Tonight!